I know, it seems a bit unrealistic that the market will break the strong support at 880 without a decent bounce first. 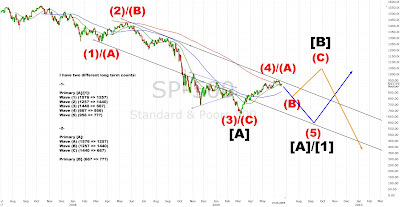 But if the market is in wave [iii] it should break the support without any problem. Let's take a look on my two long term counts. 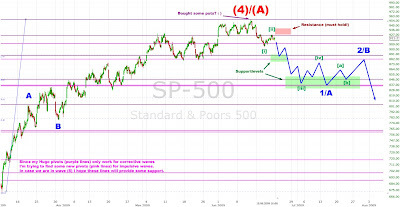 The market completed Intermediate (4) of Primary  or [A] in June 09 at 956 and is now in Intermediate (5). Wave (5) should last a couple of months and make new lows. If we see some corrective stuff in the next weeks the orange forecast should be the right one. After a correction to about 800 we should see new highs later this year before Primary C will start.